Alexandros Spyropoulos is a Software Engineer currently working for Maple Syrup Group. 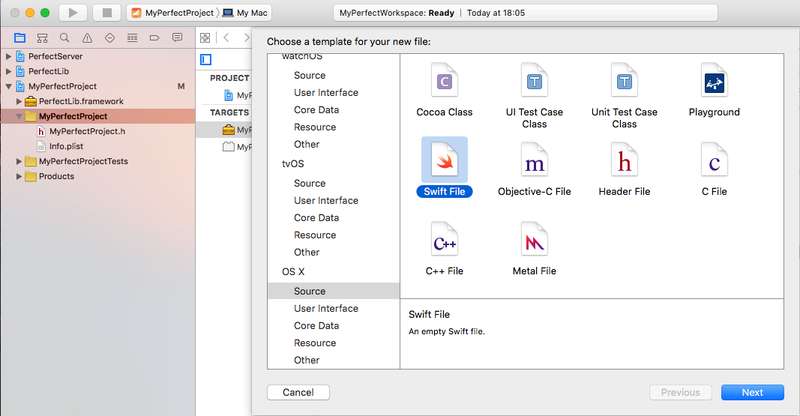 In this Blog he will publish posts about coding in Swift. 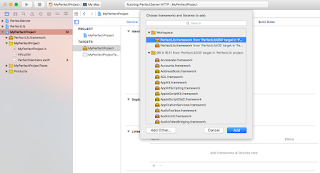 Perfect is a new framework for building server side applications in swift programming language. I recommend to pay a visit perfect.org and get the source code from github. However, there is no tutorial for starting a new project yet. Given that, I will take my shot to explain at the best of my ability how to get a Perfect Server Up and Running in 8 Steps. Perfect is not available in cocoapods yet. We are going to download the whole repository first but we are not going to use it directly as it is going to bloat our repository. Later when a pod is available we will disconnect it from our project and we will use the pod instead. 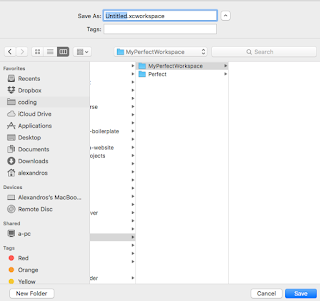 On the top of our Xcode IDE there is a breadcrumbs set active scheme input, click on the first element. 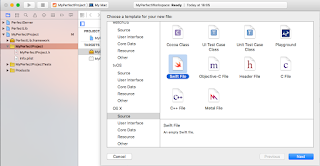 We will notice that the icon of the scheme is changed from a framework suitcase to a swift app one. 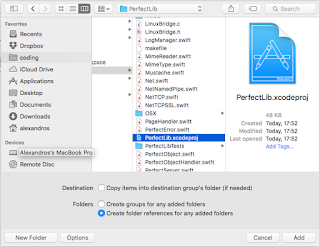 Select MyPerfectProject and Run. 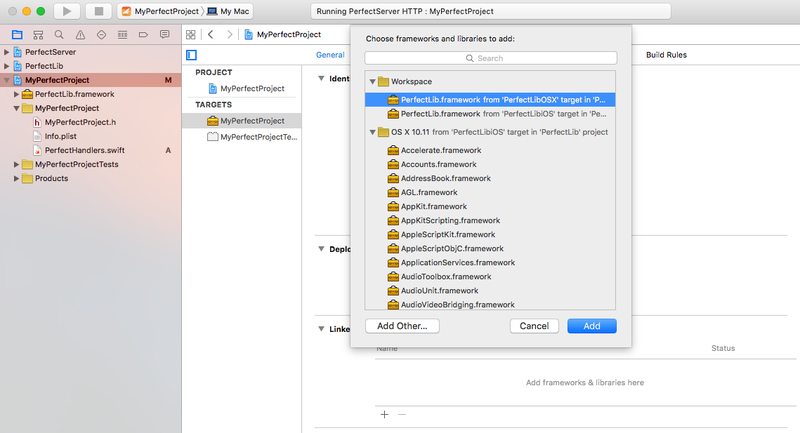 Now, we must be able to launch PerfectServer HTTP App when we run MyPerfectProject scheme. We are not ready yet though. 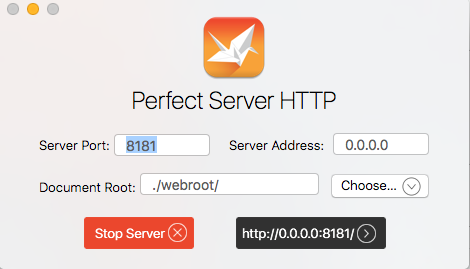 while we launch the HTTP Server we are not loading our framework as a module in, yet. Before we load our project as a module in "PerfectServerHTTP App" we need to make PerfectLib available for it. 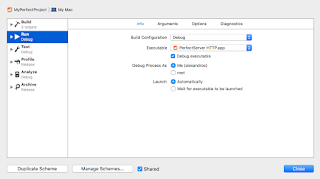 Then we need to set our Project Build Settings to build our project in directories that will allow "PerfectServerHTTP App" know about them and load our project(s) as a module. Now that we have all the plumping set we can start writing code. 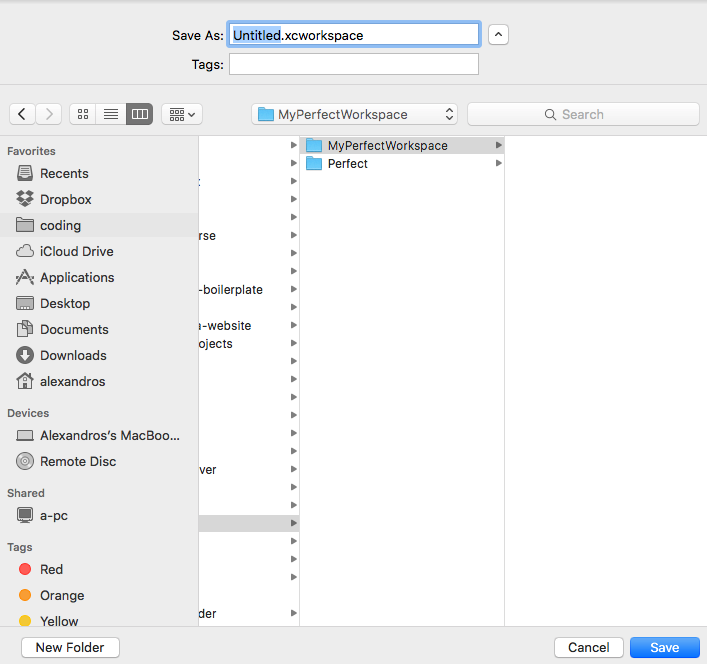 First we need to make our PerfectHandlers.swift file which will contain our init methods. Think about it as our main file. //public method that is being called by the server framework to initialise your module. // Install the built-in routing handler. // Using this system is optional and you could install your own system if desired. // Check the console to see the logical structure of what was installed. Awesome! Now we have everything we need. 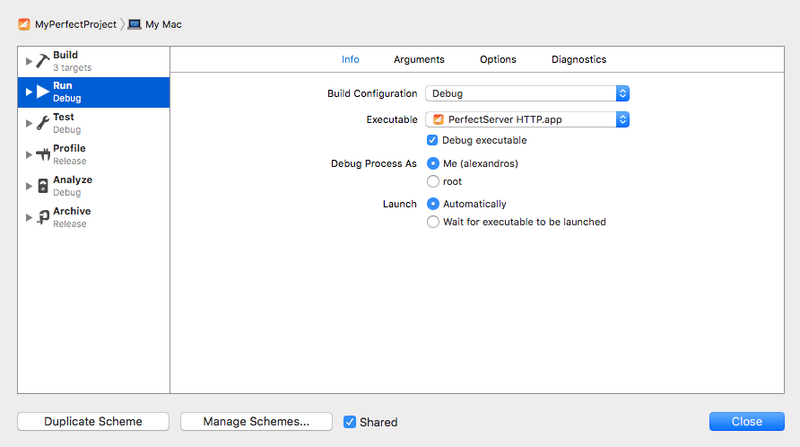 To run the project make sure that you have set MyPerfectProject as active scheme and hit Cmd+R or the Play Button. Click at the black button to launch the index page and ta-daaaaah. We have a "Hello World" html page served from our new Perfect Server. You can clone my project and use it as a boilerplate if you feel lazy. find my source code in github. 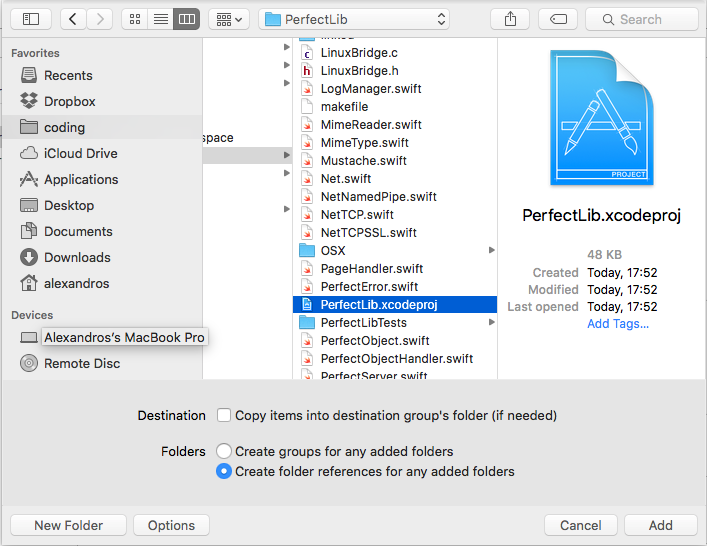 You still need to clone the Perfect source at the same directory.